And so it’s go time for Liverpool Biennial, the juggernaut of international contemporary art which runs across the city every 2 years. This 10th edition is titled Beautiful World, Where Are You?, which works as a very loose theme. Most works here have not been made specifically for the Biennial or in response to the title, but have been chosen for fitting in with it somehow. It’s also, as ever, massive: even over two days I haven’t covered some venues yet (and that’s before I even start to get onto Independents). So after trialling some different ideas of how to share what’s on with you, I’ve gone for a kind of ‘zonal’ presentation, grouping the venues into rough sections to make at least some of it easily visitable in a short time. Let’s start around the waterfront, then, where the exhibitions are based in 3 established institutions. They’re also fairly self-contained: each artists only features in one space. If you’re not a regular Biennial explorer, then it’s a good place to get a sense of what the exhibition as a whole is about. At Tate, my favourite part is the ground floor’s immersive installation The Intermediates, by Korean artist Haegue Yang (see featured image). She’s created a space in which it really does feel like you’re exploring a unknown environment, one populated by maypoles and anthropomorphic sculptures, and of creatures heard but not seen. If this sounds like it could be an idealised imagining of historical heritage, contemporary wall designs and artificiality of the plants stop you from falling into a dream of the past by making you aware of the influence of now. Colourful, atmospheric and surprising, it’s an enormously appealing way to explore the modern world’s attitudes to traditional culture, how images become processed signifiers of particular ideas and an otherness than was never intended in the original. Upstairs is more mixed. 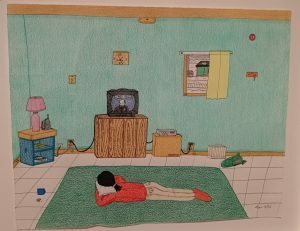 I had been looking forward to seeing Annie Pootoogook’s drawings, which don’t disappoint. Chronicles of the realities of modern Inuit life, her subjects range from sitting around and watching TV to a scene of domestic violence rendered with surprising ordinariness. In every sense, it’s a vital documentation of a cultural reality beyond the standard image preserved in museums and galleries as the public face of indigenous life. I also quite liked Kevin Beasley’s Your face/ is not enough, which turns gas masks and megaphones into statements of individuality. The effect is either defiant or absurd – perhaps both. But I was left cold by Brian Jungen’s Nike trainer headdresses and Duane Linklater’s taxidermical experiments. They felt obvious, and obvious is not what I want to find at a Biennial: I want the unexpected and adventurous. That said, it is no surprise to find the Mann Island venues each covering the kind of content they are best at: photography at Open Eye Gallery and the built environment at RIBA North. Open Eye hosts George Asodi’s rather nice photography series Nigerian Monarchs. 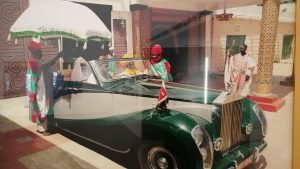 Osodi’s stated aim is to show is these tribal figureheads, ceremonial reminders of the impact of colonialism, “in the stately and dignified manner that befits them”, and they certainly do. Each portrait captures a sense of confidence and self-assuredness in the sitter, giving a real meaning to the ceremonial regalia. Upstairs is a film by Madiha Aijaz exploring the relationship between the uses of Urdu and English in Pakistani libraries. Whilst I found it interesting, I’m not sure I can say I enjoyed it. It perhaps felt more like a documentary than a piece of art. But then, Mae-Ling Lokko’s Hack the Root at RIBA North works well as a little of both of those things. It may not be aesthetically stunning, but in terms of ongoing value it’s one of the most important pieces in the Biennial. By working with Toxteth’s Squash Nutrition and the pupils of a local primary school to manufacture building materials made from (basically) mushrooms, Lokko has put the process forward as the art, with this installation showing us the results so far. As I said, there’s not necessarily much to look at – the material is a dull beige, and her video is a straightforward explanation of the process. But in terms of ideas and providing a hook for inspiring change – to make those kids feel like they’re part of something – this needs to be here. If we want to keep our “beautiful world” anywhere near us, we need the ideas of Lokko and her collaborators to catch on, to challenge us to think in new ways. And from Pootoogook’s drawings to Lokko’s bricks, there’s some good ideas around the docks this summer to help us do just that. This entry was posted in Exhibitions, Home, Liverpool Biennial 2018, Past exhibitions and tagged art, Biennial, Liverpool. Bookmark the permalink.